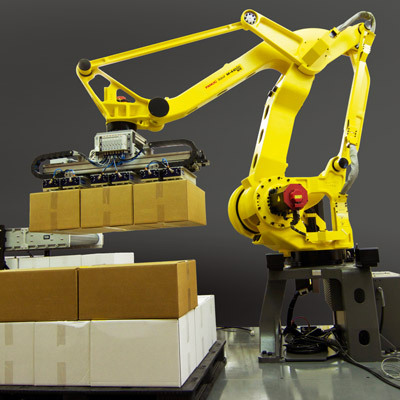 The palletiser – designed specifically for the job, this series increases throughput on palletising and handling applications. 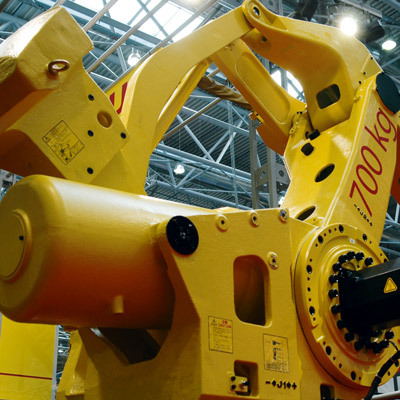 With a capacity up to 700 kg and a reach up to 3.1 m, the 4 or 5 axis M-410 parallel link robot series is ideal for handling medium to heavy payloads. 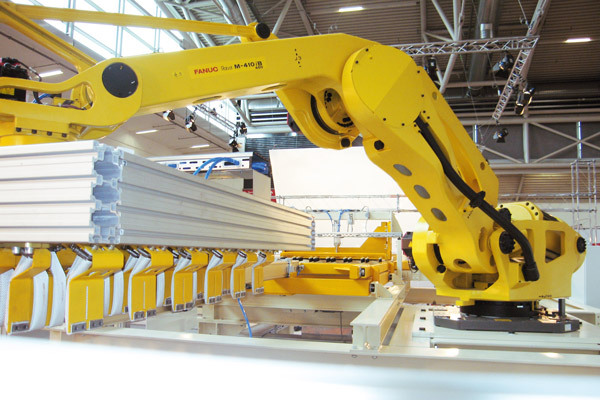 FANUC was one of the first robot suppliers to develop a series specifically designed for palletising and draws on years of experience in end of line automation. 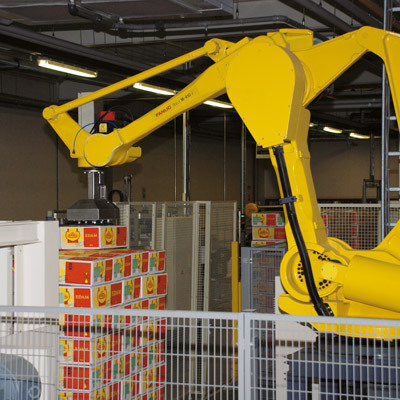 Operating within an optimised work space and benefiting from a high vertical stroke, the M-410 palletising robot is specifically designed to stack pallets up to a height of 2 metres. The integrated base and controller in the pedestal (non-pedestal version is also available) not only saves floor space but also makes transportation and installation easier. 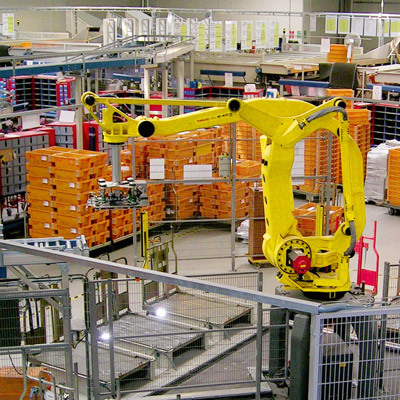 Designed specifically to increase throughput on palletising operations, the M-410 series is capable of multiple palletising configurations and features a large vertical work envelope. Internal cable routing through the wrist prevents cable interference and increases cable life. 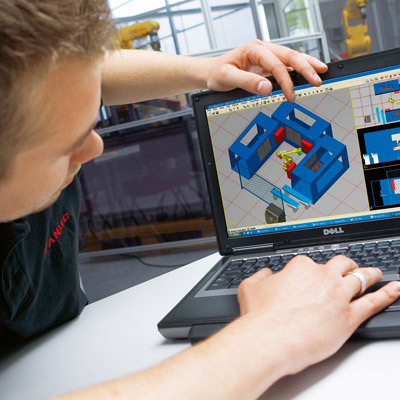 By simulating your production scenario, Roboguide shows you exactly what the M-410 can do for you and where the savings lie. 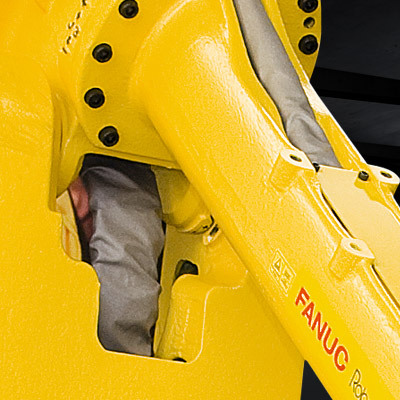 High wrist moments and inertia mean the M-410 can handle large grippers and heavy payloads at maximum speed. 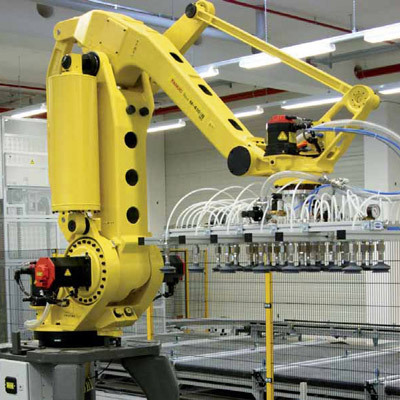 For better adaptability in handling different sized products, the M-410 can also be fitted with a servo hand that is controlled by the 6 axes servo. With models capable of handling anything from 140 to 700 kg payloads, whether it be boxes, bags or slabs of concrete, there is a M-410 for every palletising job.